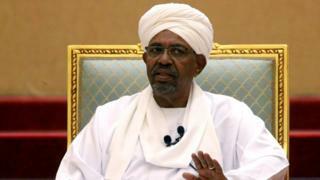 Sudan former President Omar al-Bashir don move to Kobar maximum security prison, days afta military seize power from am. Tori be say di former leader until now bin dey under arrest for presidential palace under heavy guard. Dem keep am for one lonely place and na tight security surround am. Months of protests inside Sudan lead to di removing and arrest of di long-time ruler on Thursday. Uganda's foreign minister Okello Oryem don tell Reuters news agency say di kontri go consider to offer di former Sudan leader asylum if im apply, upon di International Criminal Court (ICC) international warrant for im arrest. Until now, nobodi bin know wia Bashir' bin dey unknown afta dem comot am from power. Di coup leader at di time, Awad Ibn Auf, bin say oga Bashir dey detained inside "safe place". Him himself step deon afta. Lt Gen Abdel Fattah Abdelrahman Burhan na im dem con name as head of di transitional military council, to become Sudan third leader inside many days. Demonstrators don vow to stay for streets until dem get immediate move to civilian rule.